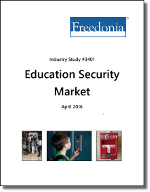 This study analyzes the US education security market. It presents historical demand data (2005, 2010, 2015) and forecasts (2020, 2025) for electronic products (e.g., alarms, access controls, video surveillance, contraband detection), mechanical products (e.g., locks, security storage equipment, door security hardware), and services (e.g., guarding, alarm monitoring, systems integration, security consulting, pre-employment screening). The study also considers market environment factors, evaluates company market share and profiles industry players including Tyco International, AlliedBarton, Stanley Black & Decker, and Securitas.